“Where are you living?” is a question that I hear often from family and friends. I moved to the US in mid-2014. The good Lord knows I am a wanderer at times, but I am in Louisiana again, folks. This is my street. The house number is not mine as it was not in existence when Google took this image. I am on a wooded lane in Louisiana, about an hour’s drive from downtown New Orleans. I live in a small village that is having growing pains as the wetlands to the south disappear and New Orleans continues to shrink due to decay, crime and the like. The area is filled with new settlers fleeing the south. Recently the good folk of Abita Springs, my small town, revived a local myth about the town. 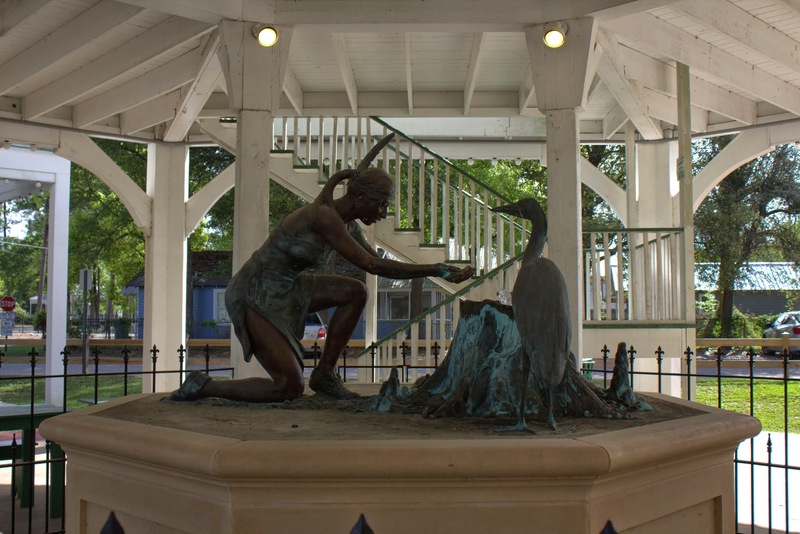 Abita was supposedly an Indian maiden whose name mean life. She used spring water from a cypress stump to heal the sick. Whether or not the tale was fact or fiction, we kept the water and made beer. Abita Beer is a fashionable hand-crafted beer that is produced here. It’s frightfully expensive, and I don’t care for the taste. Otherwise, I might have produced a photograph for you, but nay, I don’t like. Okay, now you have it – the street view as well as the most prominent public figure of the town. Soon, details on the rest of my exterior life – such as details on gainful employment and such. One cannot remain a former missionary forever, after all. I was living in New Orleans, Louisiana, when Hurricane Katrina came ashore. The experience was surreal. Personally, I escaped unharmed. My home had minimal damage. What made this a milestone in my life was the totality of the experience. It’s hard to imagine turning the dial on the radio, and there is only one radio station on the air. All the others lost transmission for weeks following the storm. Of course with no electricity we had no access to other media. We were unable to locate relatives and friends because most telephone and cell towers were down. We had no access to buy food, medicine, fuel. Hospitals were rejecting patients to care only those most urgent and those who could be saved. A dying, elderly neighbor was sent home to well, die. Everything changed in one day. When I was allowed to visit my home, but not stay there, troops were literally on every corner in the city and suburbs. Helicopters buzzed over my home for the one day I was allowed back in my neighborhood. My home was safe, but someone had looted the garage apartment for food. Velvet Ashes is discussing the topic of crisis this week. I have lived through many other crisis situations in other countries, such as robberies in Honduras, being held up at gunpoint in Mexico, even being in the former Soviet Union when an American friend was investigated and subsequently arrested by the KGB. These situations were hard but not insurmountable. I am reminded of the words by the songwriter, Kathryn Scott, “there is a favor found only in adversity.” I remember the uncanny sense of peace that enveloped me at times during those days after the hurricane hit. Even in the midst of the country’s largest natural disaster, I literally felt the power of God’s people praying for me and the others involved in this calamity. During the spring and summer before the hurricane hit, two songs were running through my mind at odd times of the day or night. One was Bob Dylan’s standard, The Times Are A’Changin. The other tune is a lesser-known song, Dwell, a song by Casey Corum. Now that I look back on that experience that occurred a decade ago, I think of how the Holy Spirit was preparing my heart. Had I really thought about the words that Dylan sang? I doubt it. Come gather ’round people, wherever you roam, and admit that the water around you have grown. . .you better start swimming or you will sink like a stone, for the times they are a’changin’. The song, Dwell, was a song I returned to often when the slow process of piecing our lives back together began. Dwell in the midst of us/ Wipe all the tears from our faces/ Dwell in the midst of us. You can have Your way . When it really counts, the most important thing is God’s continuing abiding presence. It’s not the things, it’s not the job, it’s not even the survival of the community that matters most. It’s our connection to the ever-lasting God. In the months that followed, I spent countless hours fixing meals for volunteers who came to the city. My church became outward-focused as it had never had before. We housed teams for months, maybe years. I don’t recall. I do recall that my months of service led me to a deeper conviction to pursue a missions call to Honduras where I lived for eight years. When a hurricane hits, whether it’s a meteorological event, or a metaphorical storm, I know two things are certain. One, change is inevitable. But in the change, we have a rock, we have a high tower, we have a God that dwells within, making a way for us. Sundays i n My City are sponsored by Unknown Mami. Mardi Gras is just around the corner. The city is awash in parades, bright colors, and music. 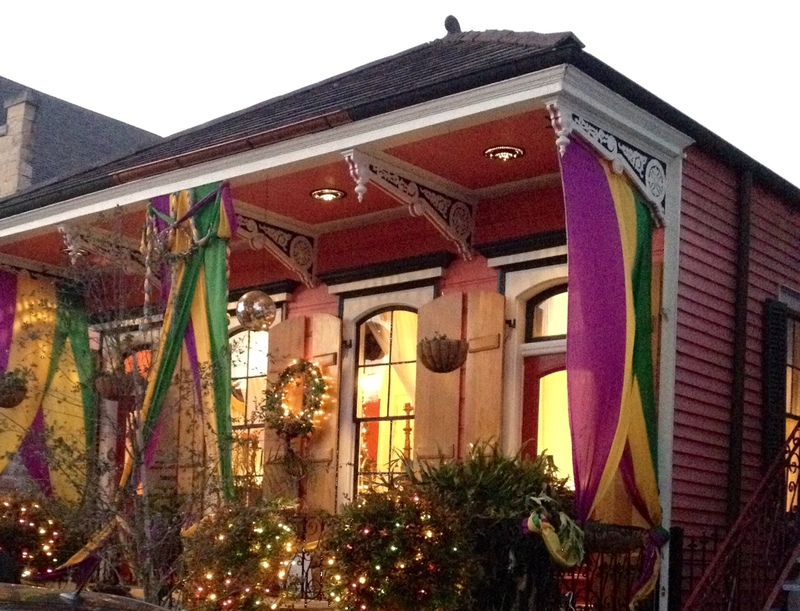 This house is in the Faubourg Marigny District. We were walking to Arabella’s Casa di Pasta after viewing a parade. In just a few hours, I will be in a different land: the land of Mardi Gras. I am driving from the ‘burbs straight into the decadence of New Orleans. 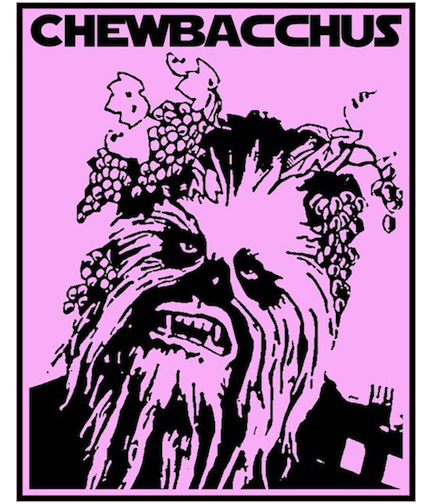 We are going to view what could be argued as the most ridiculous crew this year: The Intergalactic Krewe of Chewbacchus. Long live the Wookie! Today, I ran across a map published by Tufts Magazine that explains somewhat why I don’t fit in sometimes with the button-up missionary types I meet at conferences. 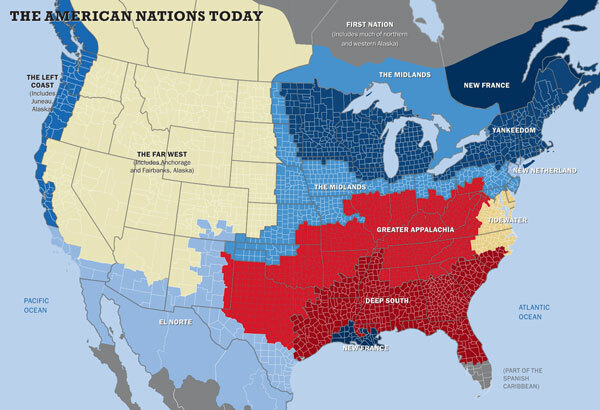 Someone with too much time on his hands arranged a map of much of North America according to regional differences, showing each locale as a separate nation based on ethnic origins and cultural patterns. This map explains a lot. I am not a redneck, nor an Appalachian. I am a native of New France. I didn’t grow up on boiled peanuts and corn pone, nor moonshine. When I grew up, we had good food, and we could drink openly. I found a new website that some of you may like, especially if you are a woman living abroad. It’s called Velvet Ashes. The current post is about thriving, and readers are asked to submit comments or stories about what it takes to thrive, especially in relation to living abroad. See ya’ next time I serve up something at the Gumbo Pot. 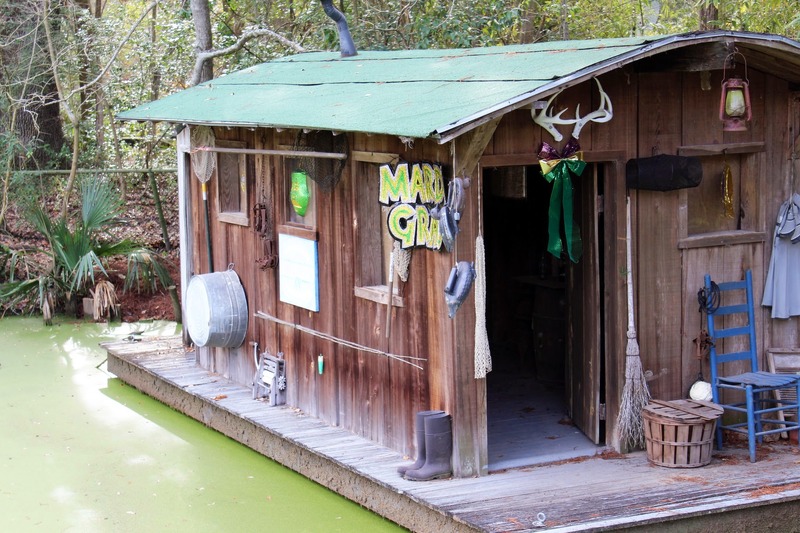 As part of the Audubon Zoo exhibit in New Orleans, there sits a Cajun houseboat. It’s docked near the levee on the Mississippi, where the river takes a turn toward uptown. If you’re tired of winter, come on down to New Orleans. The weather is balmy, the living is easy, and yes…I suppose catfish are jumping, too. Sundays in My City are sponsored by Unknown Mami.